Schmidt brought up research from the Forrester group, which suggested that a third of people looking to buy something started on Amazon - more than twice the number going to Google itself. 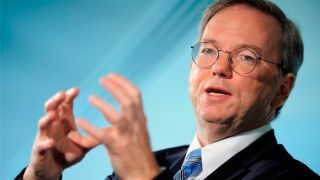 Much of Schmidt's speech was designed to downplay talk of Google having the monopoly in tech, with the former CEO insisting that the company is merely one amongst several leviathans. Google, he said, accounts for only 10% of traffic sent to German-based Bild, the most widely read newspaper in Europe, and companies such as Zolando, Qwant and Amazon are more likely destinations for those planning a purchase.. He went on to mention other companies that dominate their respective markets, while bemoaning the criticism of Google's dominance in search. The company has around 9,000 employees in the EU and has made capital investments amounting to over $5 billion (about £3.15 billion, AU$5.8 billion) in the region. Data privacy: how safe is your data in the cloud?